Bhavishya,under the Directorshop of Swami Sandeepananda Giri is located within the campus of Salagramam ashram, in Trivandrum. It is a Waldorf Steiner- inspired school that uses alternative methods of teaching that are child-friendly and makes learning an enjoyable adventure. As the name suggests, Bhavishya believes in building a meaningful foundation for every child’s future. For us, each child is gifted and special. At the moment, we have classes from Play School to Grade -6. We will be upgrading each year and will be following the CBSE curriculum. 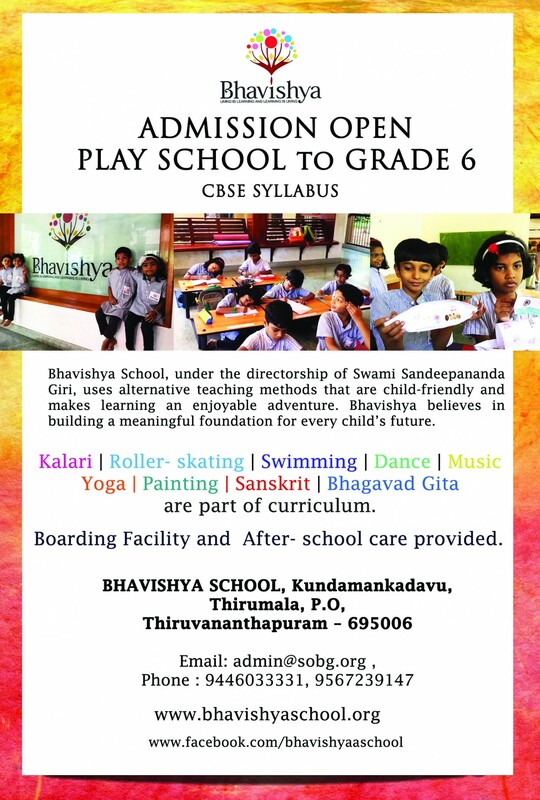 Extra special facilities that we offer include Counselling, After -school care, Boarding, classes in Kalari, Roller-skating, Yoga, Dance , Music, Sanskrit, Bhagavad Gita, Special English. YOU ARE WELCOME TO VISIT THE CAMPUS AND SEE THE FACILITIES.